Last Saturday, on a beautiful sunny day some of our LAJF staff were joined by 17 wonderful Alumni, friends, and family at Camp Rising Sun for Maple Syrup Day. 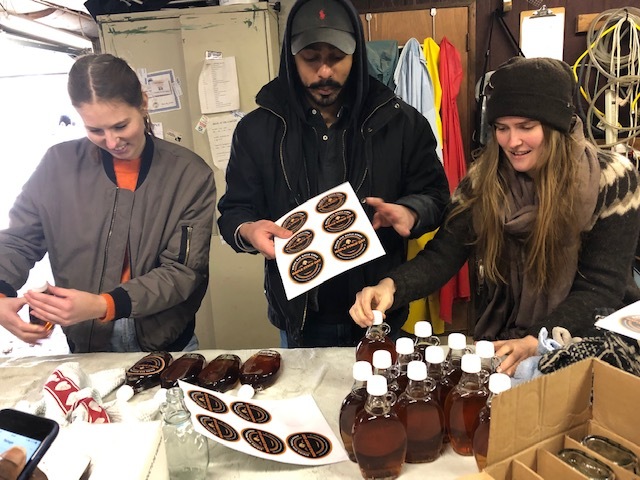 They learned about and assisted in the making of Rising Sun Maple Syrup from scratch. They had a great time listening to Cameron’s instructions on the whole process. First, several weeks ago leading up to the event, he tapped the maple trees. Then on Saturday, volunteers assisted with collecting the sap from the trees. Scott and Tiina Kaye took turns boiling the sap over an outdoor stove until the water evaporated. Some alumni gathered wood to feed the fire and others congregated around reminiscing about their time at Camp. It was a great opportunity to step into the spirit of teamwork and project time. The additional steps of the processes took place inside the garage, where Cameron set up another stove to boil out the excess water until the syrup is rich and golden. The rest of the volunteers were busy filtering and bottling the syrup. Lastly, labels were put on the bottles. The final product tasted amazing. After all the hard work, we all enjoyed a delicious lunch. It was a really fun filled event. It was exciting to see alumni from different generations coming together from Tiina, who will be celebrating her 30th reunion this summer, to a camper from last year. We were excited to see some old friends come together, some alumni meeting for the first time. If you are in the New York area, we would love to see you in our future events. Camp Rising Sun events also occur around the globe so remember to get in touch with your local Alumni Association to join their events. April 13th: New York Camper Welcome Session followed by the Board Meeting and Annual New York Reunion. May 18: May Volunteer Weekend. Join us at Camp to help set up tents, work on projects, and reconnect with alumni. Let us know if you will be joining us here. June and July: Camper Hosting. What a better way to revisit your CRS experience than to host campers before the they head off to camp? Alumni Weekend July 19-21, 2019: 30 Years of Girls' Programming at CRS: The reunion will take place between sessions and alumni are welcome to stay on Tent Hill and join in for the Board Meeting, Alumni Council, projects, instructions, and much more! There will be a special welcome for alumni celebrating 5th, 10th, 20th, 25th, 30th, or 40th, & 50th reunions, who will be able to join the reunion free of charge. Click here to register now! CRS Facebook page: Updates, alumni interviews, events and much more are posted weekly on the Camp Rising Sun Facebook page. Newsletter: Are you receiving our monthly newsletter with the latest updates and future events? If you are not, email contact@lajf.org. CRS Alumni Forum: The forum is a virtual meeting place for our CRS community, it is moderated and run by alumni. Join the conversation! Linkedin Camp Rising Sun Alumni Group: Connect professionally with Camp Rising Sun alumni across the globe.